ONE Comprehensive Resource To Help You Manage EVERY Phase Of The Grants Lifecycle. As you work to understand OMB’s landmark shift from compliance expectations to performance measures, a subscription to the Thompson Grants Compliance Expert will equip your team with comprehensive and easy-to-understand compliance guidance that has helped awardees across the country to expertly manage funding for over 40 years. 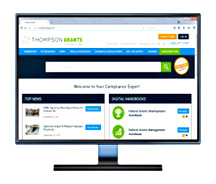 The Thompson Grants Compliance Expert puts the critical information you need about the far-reaching impact of the uniform guidance at your fingertips in a convenient digital format so you can confidently navigate the entire grants lifecycle — from finding federal grant opportunities to submitting your closeout documents — and stay up-to-date on how the complicated rules affect you and your funding every step of the way. 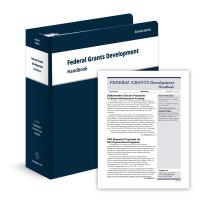 Federal Grants Development Handbook – Find federal funding, develop competitive proposals and take the steps needed to stay in compliance with the complicated rules that govern federal dollars. Most importantly, you'll stay on top of new grant guidance, merit criteria and risk-prevention procedures — all issues of particular importance as you work to understand the requirements of the uniform guidance and avoid disqualified proposals. 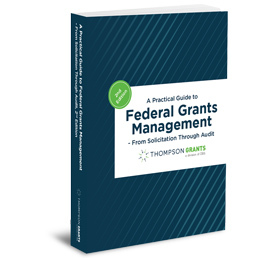 Federal Grants Management Handbook – The uniform guidance identifies the procedures and expectations for anyone who works with or monitors grants, but, more importantly, it shifts the focus from compliance to a new emphasis on performance. As the most comprehensive and trusted guide for the federal grants community since 1978, this resource can help you manage your funds in light of the increasingly complicated regulatory landscape, including how the guidance impacts financial management systems, procurement and property standards, audit resolutions, time and effort documentation, financial and performance reporting, and more! Single Audit Information Service – This A-to-Z guide breaks down the most complex and potentially confusing single audit requirements for grant recipients that expend more than $750,000 in agency funding. But what if your organization doesn't make the audit threshold? 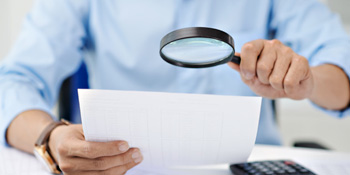 Are you still subject to a federal audit? What should you prepare for? Find out about the audit process, different types of audits, the most recurring audit findings and how to avoid them. 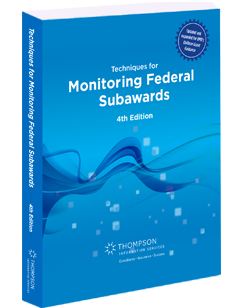 Techniques for Monitoring Federal Subawards, 4th Edition – A no-nonsense reference for pass-through entities, subrecipients and contractors alike, this guide is a must have for any who need to understand their increased responsibilities under the uniform guidance. The Complete Thompson Grants Webinar Archives – with 24/7 access to 40+ on-demand training webinars covering a wide variety of topics. News Alerts and Expert Commentary – so you are always up-to-date and in-the-know about the latest grants headlines and how they impact you. “Ask the Expert” Function – like having a personal hotline to our experts so you can get your organization's specific questions answered! Access for 3 Users – make sure your colleagues have the latest intel on the regulations and best practices, too. Special College and University Version Available! 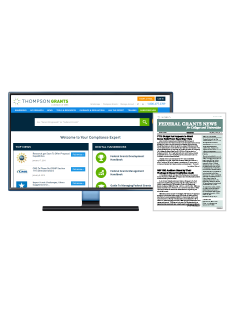 The Thompson Grants Compliance Expert for Colleges and Universities is designed to help you through these complex times for grants managers on campus and to manage federal grants more effectively. You’ll also receive the monthly Federal Grants News in print, which covers events unfolding in Washington and their likely impact on your institution, and the Federal Agency Weekly email alert, tracking federal grants policy issuances, rulemakings and guidance development from numerous government agencies and offices. You will receive one year of access to the Thompson Grants Compliance Expert, at grants.complianceexpert.com. Your annual subscription includes rolling updates, news, analysis, training tools, forms and more at no additional charge for the 12-month subscription period. If you have any questions or would like information about multiple user discounts or site licenses, please contact Client Services by phone at 1.800.677.3789 or by email at service@thompson.com.